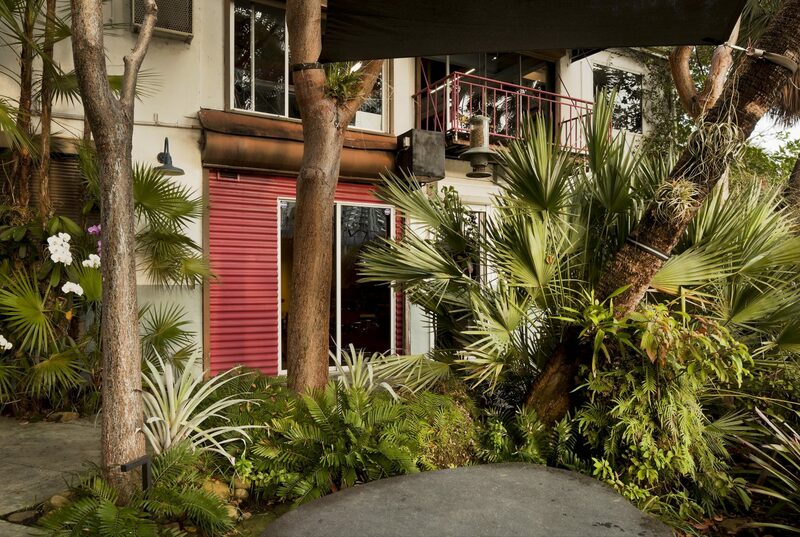 Jungles River Studio | Raymond Jungles, Inc.
Our studio began to occupy the second floor of an industrial building about thirteen years ago. In its previous life the building was an old awning warehouse surrounded by asphalt and hard surface. 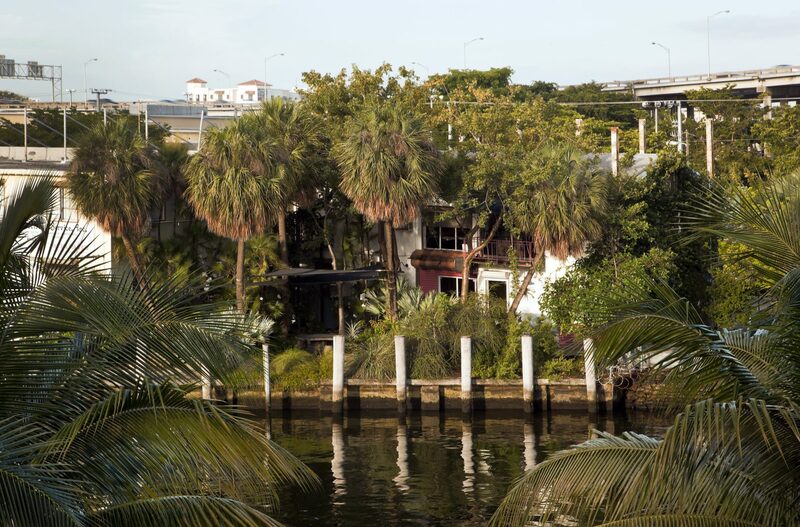 The “concrete jungle” was full of potential, positioned on a slight bend in the Miami River just east of I-95. 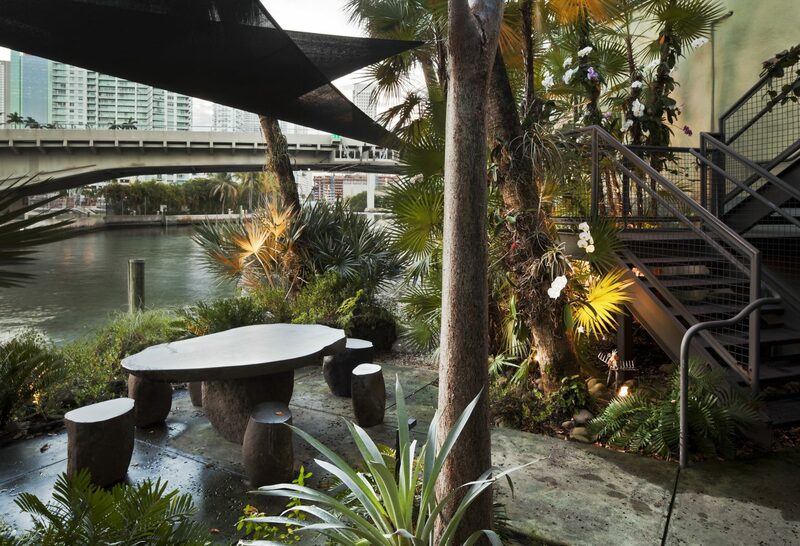 Raymond designed the entry garden along the edge of the Miami River, creating a verdant oasis between the high-rises that dot the riverfront. 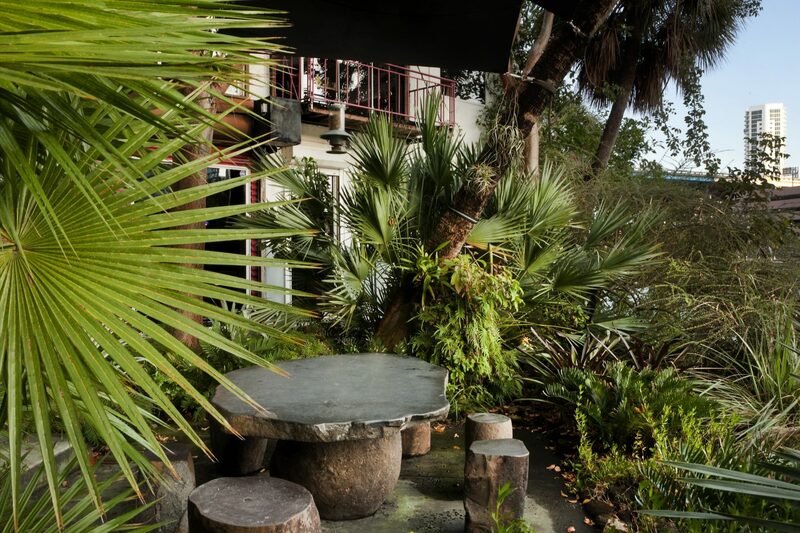 Raymond was driven by habitat creation and selected native palms and shade trees to demonstrate their success in an urban area. As time progressed, a microclimate emerged for his studio’s enjoyment. 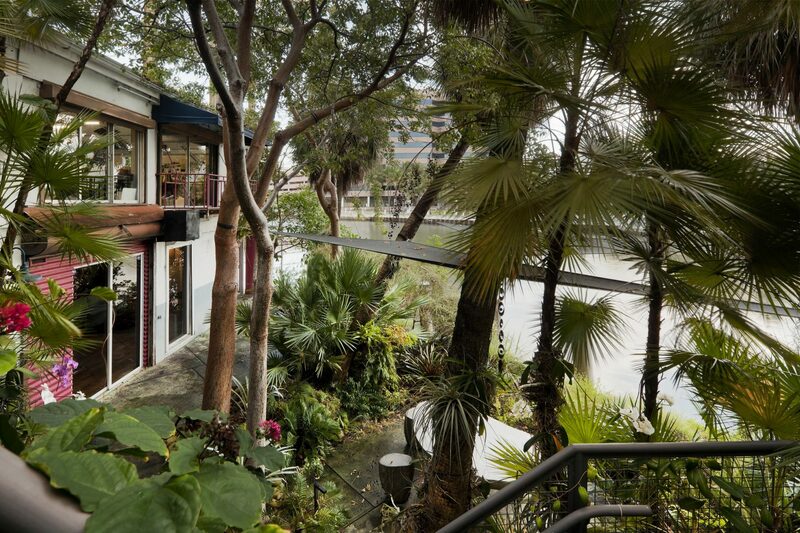 Patina-stained concrete pavers lead to a lower garden area with river views framed by character Sabal palm trunks adorned with flowering orchids and epiphytes. 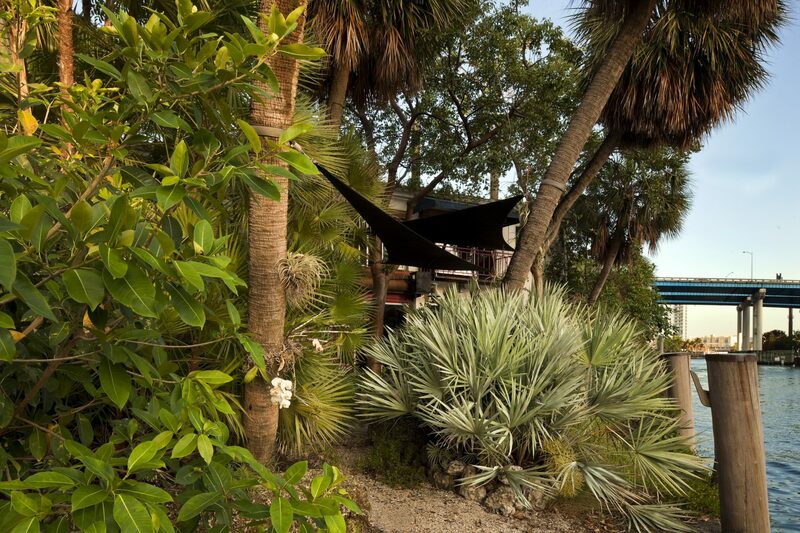 Lunch hours and impromptu meetings are held underneath two distinctive shade sails designed by the late Bamboo Barry. Welcome distractions have occurred, from the occasional manatee encounters to the hum of weathered shrimp boats returning from a hard day’s work. 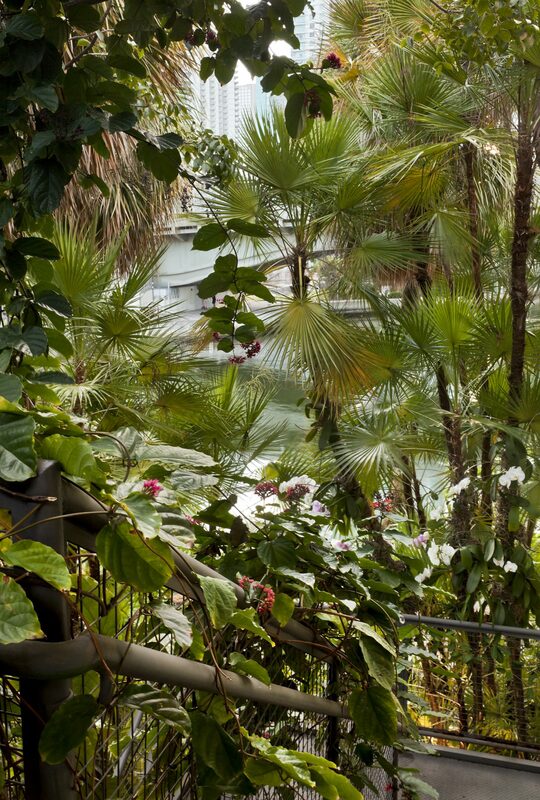 The garden is low maintenance; in fact, it is intentionally left unkempt and overgrown, celebrating the wild side of Raymond Jungles, Inc. 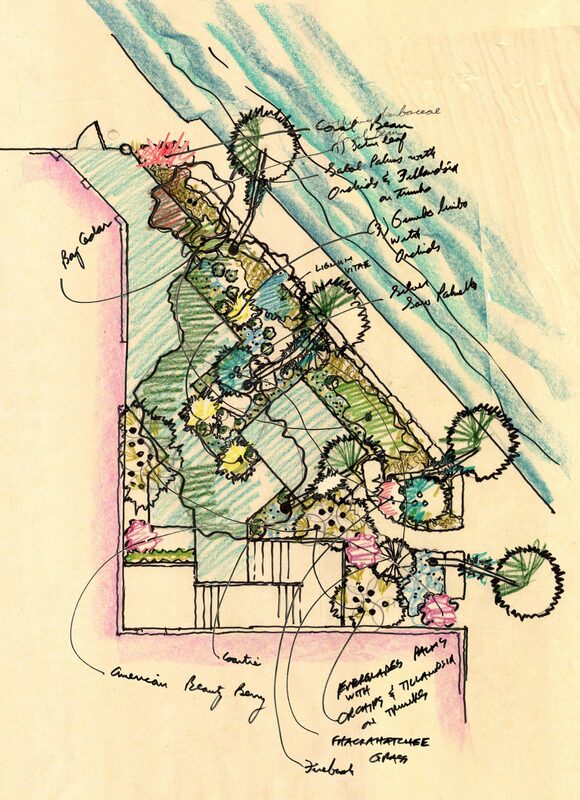 The garden embodies our firm’s desire to design wild gardens rather than manicured ones. 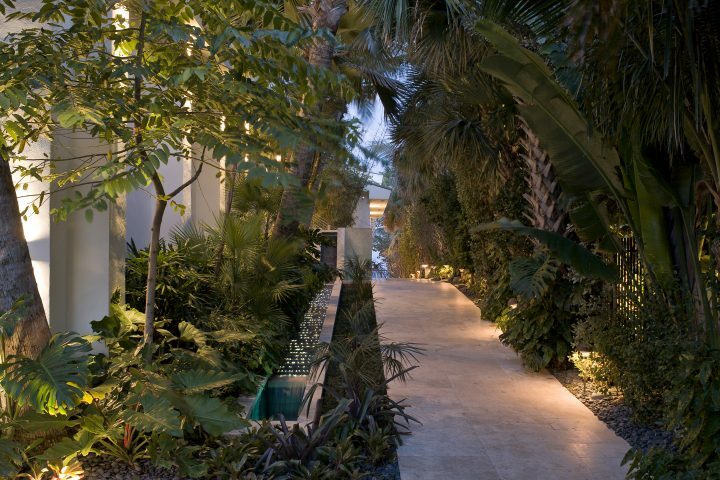 Our studio garden’s lighting emphasizes the desired fixtures and light levels for our projects. After a hurricane killed an invasive Brazilian pepper tree at the end of our street, Raymond decided to extend the garden into the public realm. Now there is a substantial portion of the Miami River shoreline that has the look of what most likely existed before manmade interventions. To date, we have completed three renovations to our interior studio space to add workstations as we have grown from a handful of designers to a staff of twenty creative minds. 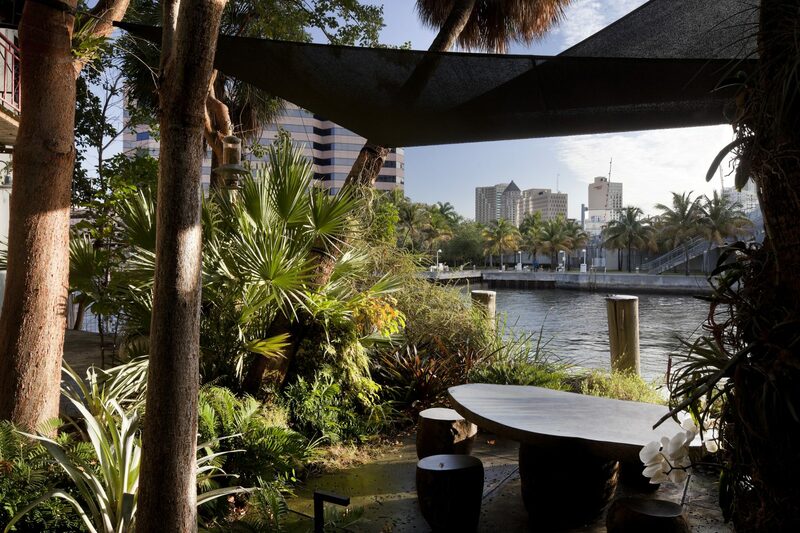 Since establishing the practice at this location, the Miami River character has changed tremendously. It was a derelict area on the outskirts of the Brickell neighborhood and on the fringe of the Little Havana community. The most recent real estate market has deemed river frontage a hot commodity. Developments will soon redefine the riverfront as an upscale, vibrant and livable district. 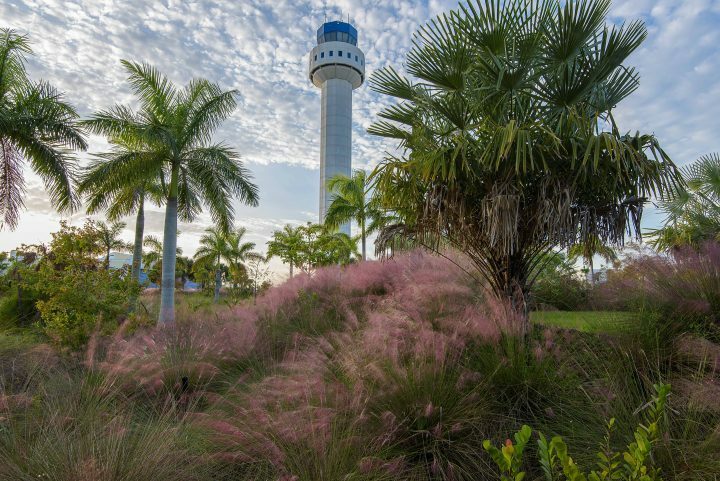 We are contributing to the river’s revitalization and have recently been engaged in a mixed-use project consisting of four tall towers, a public riverwalk and the reimagining of Jose Marti Park. 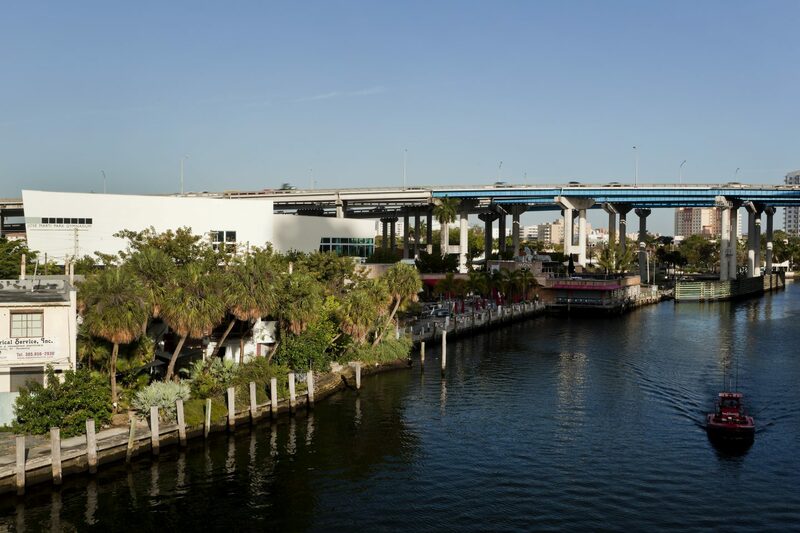 We will be setting the bar for future Miami River developments. © 2019 Raymond Jungles, Inc.